While PsDotNet surfaces everything that the COM library exposes, there may be functionality that is missing. Additionally, there may be a need to automate 3rd party plug-ins. PsDotnet Listener is a standalone application that is intended to help developers extend what PsDotNet can do. It provides the developer the ability to echo back simplified C# code snippets as actions are performed in Photoshop. These snippets can then be copied and pasted directly into a C# project using PsDotNet and used and modified as necessary. 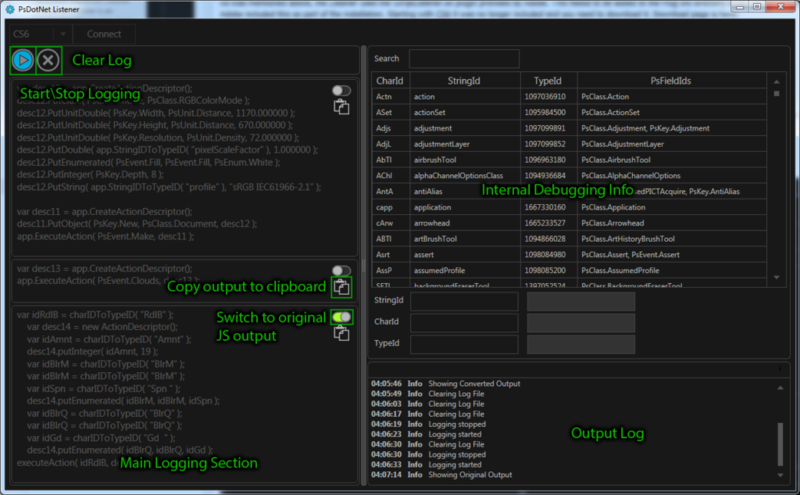 The Listener uses the ScriptListener.8li plugin provided by Adobe with a custom parser to generate usable C# code. From this we could start constructing a method where we could simply pass in the name of the tool we want to select and have a single method for doing switching to all of the different tools. This is an very simple example, but where this can come in quite handy is with 3rd party plugins that you may want to script. Clicking Clear Log button will clear the ScriptingListenerJS.log and ScriptingListenerVB.log files on your desktop. Doing this occasionally is a good thing. Especially if things feel a bit sluggish. Clicking the switch in each section will toggle between original and converted output. Clicking the clipboard button will copy it to output the clipboard.